Take advantage of our FREE shipping and postage charges. Great savings and no extreme postage or shipping fees and no nasty surprises, because we pay for shipping Not You! * A unique identification tracking number for every shipment is available upon shipment. Flat Rate is FREE for Airmail, which is the fastest way to receive your order promptly. We cannot track or ship to just a few countries. If there are any issues we will contact you. Your order will be processed within 2 working days. Production of your order is 3-5 days Please allow up to another 14-21 days for delivery by Airfrieght worldwide. In peak times such as Christmas allow 3-5 extra days. Orders requiring delivery by a certain time or date should be ordered well in advance to avoid any delay issues. At Christmas time International Post is always busy and a little slower. Orders received between 7-24 December will be delivered in January -February. International orders need to allow up to 2-4 weeks for delivery after production. Of course, its very likely if you are in the US you will receive your shipment within 10-14 business days after production depending on US Customs and USPS, but do allow a little longer as delays can occur for overseas shipments. Our production unit is located in Asia. 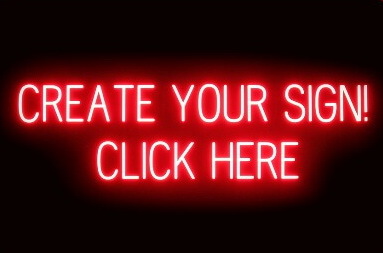 Open your Neon Sign within 24 hours or in front of the delivery driver if possible. Notify us immediately of any problems so we can address them quickly. Claims for breakage MUST be made within 48 hours of delivery. If you're not happy, we are not happy! Please email ShackSign within 48 hours of delivery of your product if you require a refund or replacement. Please include in your email the reason you are requesting refund. Simply return your unused product to us within 7 days and we will offer to replace or refund. If there is a reason you are not completely satisfied with your purchase (conditions apply) we will give you a 7 day money-back guarantee from the time you receive the goods. Any refunds issued are via PayPal only. Please email us within that time if you are not satisfied with your purchase so that we can resolve any problems. This refund policy does not apply to goods which have been worn or misused, deliberately damaged after delivery, change of mind, or if any attempt has been made to alter the product or if they have been dropped or broken in transit (optional extra insurance is available at buyers cost). Our products may not be suitable for all intended display purposes. LED lit signs located in bright sunlight windows may not display brightly during the daytime. We assume no resposibility for product display applications or installations. We recommend using glass tube neon signs for very bright sunlit applications. All products must be returned in their original condition. All postage and insurance costs are to be paid by the buyer. Refunds are not issued until the goods are returned or damage claim is actioned by us. We recommend that you return the product via Registered post and that you pre pay all postage. You assume any risk of lost, theft or damaged goods during transit ; therefore advise you take out shipment registration of insurance with your postal carrier. ShackSign.com will not be responsible for parcels lost or damaged in transit if you choose not to insure. We routinely ship to mainland Australia, NZ, USA, Canada, UK and Japan. Buyers from all other countries, it is your responsibility to check your local regulations and customs restrictions. Sorry we have difficulties shipping to Brazil as postage charges to that country have increased significantly and articles can take in excess of 8-14 weeks to arrive. Brazil customers please inquire prior to your order. Place your order now to receive Free World Wide Shipping!